So, Apple killed the headphone jack. Now what? For anyone that bought, or plans to buy, an iPhone 7 there are a few options. One: keep using your headphones equipped with a 3.5mm jack along with Apple’s 3.5mm-to-lightning dongle, which you will likely lose and have to shell out $9 to replace. Two: buy a pair with a lightning connector. Three: go wireless. The first two options are fine, but Apple would prefer you choose door number three. Though it’s not clear why, except perhaps to sell its own AirPods at $159 a pop, the top minds in Cupertino want to push the world toward wireless audio. There are many, many legitimate arguments against choosing wireless audio over wired which I will not dwell on here, but instead suggest you find a truer audiophile than myself to enlighten you. But this, a sad headphone jack-less world, is what Apple has given us. So, let’s play along. Let’s pretend we’re not mourning the loss of the industry standard for audio transfer. Let’s show the courage to look forward, to our inevitable wireless future. One company that is more than happy to look forward is FIIL Technology which, via a Kickstarter campaign, is on the cusp of releasing two intriguing pairs of wireless headphones, the FIIL Diva and FIIL Diva Pro. The company sent me the former, which I’ve been testing for the last few weeks. First, these are a handsome pair of headphones. The design is decidedly simple, but works well with the all black option I tested. It’s not gaudy or built on unattractive embellishments. The FIIL branding on the side does light up, which adds a nice bit of flair without going overboard. Let me be clear, the Diva are far from a utilitarian device. It’s obvious care was taken to make these appealing to the eye, and the minimalism at work does a nice job toeing the line between being plain and drawing too much attention. They are constructed out of plastic, with leather-like earcups and though I would prefer an aluminum or other metal construction, at $199, it’s no surprise FIIL opted for plastic here. It’s hard to say if durability takes a hit given that I’ve had them less than a month, but the general wear and tear I’ve put them through has been handled gracefully. They also come with a nice hard shell case, and are foldable for portability. The Diva are on-ear headphones, which makes them a tough sell for me in terms of fit and comfort. I hate on-ear designs, but my disgust has little to do with the form factor itself. Simply put, on-ears and I do not go well together. My ears are shaped in a way that, no matter how hard I try, I can never seem to position on-ear headphones so they aren’t pushing my ears in and down, thus cutting off my ability to, you know, hear. Usually, I have to employ an awkward combination of opening my jaw slightly and pinning my ears back in order to get the best sound. It’s a nightmare. The FIIL Diva are the closest any pair of on-ear headphones have come to making me believe the form factor could work in my life. The first time I put them on I expected the usual mixture of frustration and discomfort, but instead found them delightful. The earcups are incredibly cushy, the band doesn’t squeeze your head like a vice and they’re light enough so you don’t feel like you’re putting in more effort to keep your head upright. In the end, though, my painful history won out. Though I never found them uncomfortable, per se, I often wished they were not resting on my ears. Fatigue was less of an issue, though still an issue as it is with any on-ear cans. The biggest problem was the one I’ve always had. My ability to hear and enjoy whatever I was listening to was limited because of the design. If you’ve had problems with on-ear designs in the past, these are not your savior. If you like, or at least tolerate them, the Diva and even more interesting Diva Pro, come with a handful of outstanding features that set them apart and should put them on your radar. Before we talk about those features, let’s talk about the most important part of an audio device. How do they sound? The Diva did not blow me away, but also did not disappoint. They reminded me of wired headphones in the same, or a slightly lower price range. Audio is crisp and clear, with a good amount of separation and better than average detail. I didn’t find anything new in most of the songs I listened to, but I also have the benefit of having heard those songs on speakers far beyond the capabilities here. The most welcomed surprise was the amount of bass produced. The low end was thumpy, but not muddy and made itself present without overpowering the rest of the feed. I did not expect the amount of punch that was offered, and as a bass lover it endeared me to the Diva tremendously. I imagine well-versed audiophiles could find holes to poke in the sound presented, but my inkling is the average consumer will pick these up and think they sound great, and be right. Also, because FIIL is not insane, the Diva do come with a headphone jack and companion cord if you want to ditch Bluetooth and wire it up. I didn’t notice any uptick in quality, though, so there isn’t much reason unless you’ve exhausted the battery. Sound is undeniably important, but the Diva’s extra features are what set them apart. Let’s start with the least compelling. Labeled as “3D” headphones, they are supposed to be able to increase the height, depth and width of the sound, but the truth is that the concept is just odd. I have never quite understood 3D sound, and that continued here. When using any of the 3D settings, which are labeled in the companion FIIL+ app as increasingly large rooms, from Living Room to Hall, the only difference I noticed was an artificial sense of distance pasted on top of the sound. Instead of creating a fuller, richer experience, it displaced the sound in a way that acted in opposition to how I want headphones to perform. I use them to create an intimacy between myself and the music, not a chasm. During my time with the device, I preferred to leave any 3D settings out of my experience. Next, and far more impressive, is noise cancelling. There is a variety of noise cancelling modes, including one specifically for windy days, that can be accessed via a switch on the right earcup, or in the app. It doesn’t destroy surrounding sound (I imagine it would if it were an over-ear design) but cuts out all sounds in the low to medium loudness range. TV noise, typing and the oppressive meows from a cat that wants to go outside but will most certainly die once his paws hit the grass, are all relegated to whispers. Anything louder than running water while dishwashing isn’t drowned out, but reduced a good deal. Though I’ve not been able to test this directly, other reviewers have placed the Diva noise cancelling close to that of Bose’s best-in-class QC line, which is high praise. A good pair of noise cancelling headphones are useless if they die halfway through your cross-country flight, though. FIIL claims a battery life up to 32 hours. I didn’t reach that height, but only because I haven’t listened to 30+ hours of music in the last two weeks. After charging day one, they haven’t seen an outlet since and still have 30 percent, or about 6.5 hours of estimated battery life, left. That’s stellar. 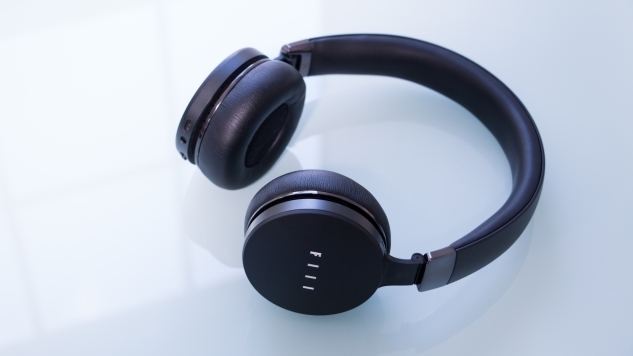 What most impressed me about the Diva, however, more than their great sound, killer battery life and excellent noise cancelling, are the simple but powerful ideas FIIL has implemented regarding user interaction. Instead of a multitude of buttons affixed to one, or both, earcups, FIIL’s headphones come with a touchpad on the exterior of the right earcup. It is not a new idea in the headphone world, but this application is excellent. To change a song you swipe back to front, and up and down, to raise and lower the volume. It takes some getting used to, your motion has to be longer and more deliberate than the quick flicks our smartphone society is accustomed to, and I couldn’t ever get fast forward/rewind to work, which requires you swipe from front to back and then hold, but otherwise the implementation is excellent. I expect FIIL to build this idea out, too, and refine it into a seamless process. Most other interactions are through the Multifunction Button (MFB) which allows you to power on/off, play/pause, check battery and other basic functions. But, you don’t need to even use the MFB for pausing a song, if you don’t want. The Diva come with a motion sensor built in that, when triggered, will pause the song you’re listening to. It’s built to identify the motion of taking off and replacing headphones and, when it works, it’s great. Sadly, it’s far too hit or miss at the moment to be a killer feature. It worked great for the first week or so, but grew more inconsistent over time. You have to remove them with a good amount of oomph, otherwise it’s easy to trick the sensor. Hopefully, with more development, FIIL can turn this into a feature that never fails. Right now, it’s a neat, simple idea that has legs but doesn’t quite know how to use those legs without tripping. The Diva Pros, which will retail for around $300, bring even more interesting features including 4GB of onboard memory so you can leave your phone at home, and smart voice interaction with voice search and the like. But even without these additional features, there are enough interesting ideas here to make the standard Diva an intriguing buy. If you’re looking for a solid pair of wireless headphones that offer good sound and great noise cancelling, the Diva should be on your wish list along with heavyweights like the Bose QC 35s. And that’s without considering the extra features FIIL has packed into these cans, all of which feel like great ideas that will only get better with time. Keep in mind this is a Kickstarter project from a very young company, so there are no guarantees. If all goes well, FIIL could be the next big name in wireless audio, and the Diva line could be the standard bearer.